Welcome to eZee Insider, your monthly gateway into all things eZee. In this edition, eZee Malaysia holds month long initiative for building strong relationships. Award winning resort and residence chooses eZee as their one stop solution provider and much more. For the month of October, eZee Malaysia team held a month long program which was solely targeted at strengthening relationships with resellers and further establishing direct relationship with Distribution Channels. The month long initiative for the month of October was held to promote new business ideas with resellers for lead generation and streamline process for responding quickly and appropriately to our customers. eZee Malaysia team also met up with four of the major distribution channels in the region, Asia Travel, Agoda, Booking.com and hotelbeds.com. For resellers a three day training meet was organized where many of the new features of eZee products were highlighted with in-depth training and feedback for further improvements. eZee believes such initiatives will strengthen the brand value of eZee while providing superior customer service to our end clients. To improve the ability to respond quickly to market quality issues from customer's perspective and strengthen support services in the domestic market and distribution. The reaction from business associates was positive and provided a new perspective towards the ever changing market. By engaging more directly with resellers, eZee plans to strengthen support reseller's service capabilities and enable them to market products more successfully without investment on their end or experience. eZee Hospitality Management Consultancy Services, undertook overall management of Naka Hotel resulting major turnaround within 4 months. Naka Hotel offers 26 uniquely designed rooms ranging from standards to deluxe and suites. its own potential and management was looking for new ideas to increase bookings and overall operation efficiency. The eZee team evaluated the entire hotel right from its décor to operations; evaluation was done with thorough study of day to day operational activities and online reviews while working closely with the management of the hotel. Upon initial findings, it was clear that the hotel lacked online presence, the décor was getting out of date and the hotel operations were not match with the increasing standards of modern hotels. One of the first challenges was to increase hotel's online presence that was achieved by signing up with major OTA's in the region such as Agoda.com, Asiatravel.com, AsiaRooms.com, etc. and updating their social media pages to meet the brand. In order to increase the brand value of the hotel, décor was also updated across all the rooms while keeping each of the room distinctive which was their hallmark. Each of the room was redesigned and updated with new amenities while restructuring room categories and added more competitive rates by studying the local market competition resulting in higher revenues. eZee team worked closely with the owner and the members of the staff in fine tuning everyday operations which play a vital role in the maintaining overall operational efficiency of the hotel. Staff members were given more defined roles and duties to follow allowing for a smoother flow of the operations. Naka Hotel was now online with various channels, the décor was updated and staff fine tuned, the standard was raised to a new level meeting all the requirements of a modern age hotel. Naka Hotel under management of eZee achieved 95% online occupancy level and with new rates the revenues were higher than ever. eZee with its experience in the industry plan to expand more into Hospitality Management Consultancy and turn more hotels and restaurants into success stories like Naka Hotel. eZee Hospitality Management Consultancy Services will help hospitality businesses to identify revenue opportunities and help them adapt the latest industry practices. eZee Reservation, online booking engine is fully integrated with your Google Analytics, eCommerce, and Adwords allows hotels to review all their analytical data from a single point. Empowering hotels to calculate accurate ROI (Return on Investment) and make more sound decisions for marketing campaigns. Direct integration with Google Analytics, hotels will not only track usage throughout their websites but also specifically trace clicks on individual adverts through which a specific booking was received through eZee Reservation. In addition to this, there are many advanced feature in Google Analytics where you can have access to detailed reports for your day to day business processes / bookings. "e-Commence" gives you the complete picture on the total amount of bookings from received from where and help you in analyzing the total business from online bookings. This helps hotels in diverting their marketing efforts towards high booking regions or source. With proper identification of the exact source, better decisions can be taken and concentrate more of your marketing efforts towards the source for maximizing revenues opportunities. Google Adwords further allows taking control of your property showing up on Google search region wise and keywords. Linking with Google Adwords with Google Analytics you can see the amount of money spent on Google Ads and business received from the same, allowing you for a better comparison giving you control over your budget spending. By setting up your "Goal" will give you complete picture on how many bookings have been confirmed by which visitor/user of your website. This helps your hotel to get a better understanding on the goals set by you and which of the campaigns have been successful. In addition, provides management with clear picture on the booking process where visitors are getting converted and where they are not and strategize accordingly. These features with eZee Reservation can greatly help your hotel grow and save costs on your marketing budget according to specific regions/specific target areas. To know more about eZee Reservation and Google Analytics, email us at info@ezeetechnosys.com or talk to an expert today. 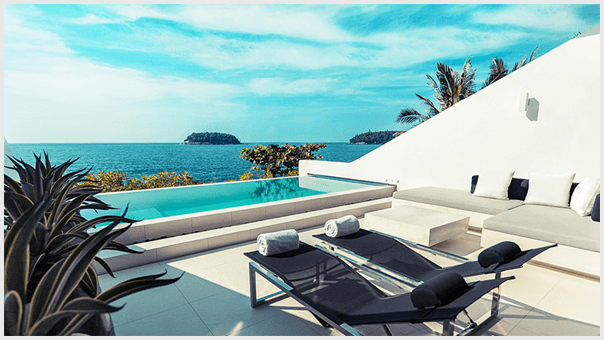 Kata Rock Resort and Residence has signed up for full range of eZee's hospitality solutions, the award-winning residence and luxury resort located in Phuket, Thailand. The resort and residence boast 34-Sky Villas with its own infinity swimming pool, and offers lavish indoor/outdoor living. Kata Rocks has already implemented eZee FrontDesk as their Property Management System which will provide a simple to use system for efficiently managing their daily operations. The Kata Rocks Restaurant, offering beautifully presented, simple, quality grilled meats and seafood will run its operations through eZee BurrP!. Kata Rock's online presence is strengthened with eZee Reservation which is already integrated into their website allowing their guests to booking directly with them easily. eZee Centrix on other hand will connect Kata Rocks with distribution channels and allow staff to manage their rates and inventory efficiently. In addition to that, eZee will implement eZee iFeedback and eZee iMenu, the online feedback system will increase Kata Rock's customer engagement and service and Digital Tablet Menu will bring a new way of attending guests in the Kata Rocks Restaurant. eZee Solutions will build a software ecosystem that will cover all aspects of their operations and bring a uniformity across the resort while providing a strong foundation to operate more efficiently and allow staff time to focus on their customer service. RSVP@Tapas at Jaypee Vasant Continetal located in New Delhi, India has adapted eZee BurrP! as their Point-of-Sale software. will allow the staff to operate more efficiently in the fast paced environment and allow staff to focus on their customer service. Implementation and onsite training was provided by eZee executive who travelled from Surat Head Office and highlighting eZee BurrP! 's features. eZee looks forward in building a long term relationship and provide 24X7 support to RSVP@Tapas.